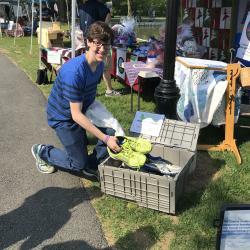 Held at Culler Lake in Baker Park, with "green" vendors, local foods, and activities promoting sustainable living practices and businesses in Frederick County, Md. 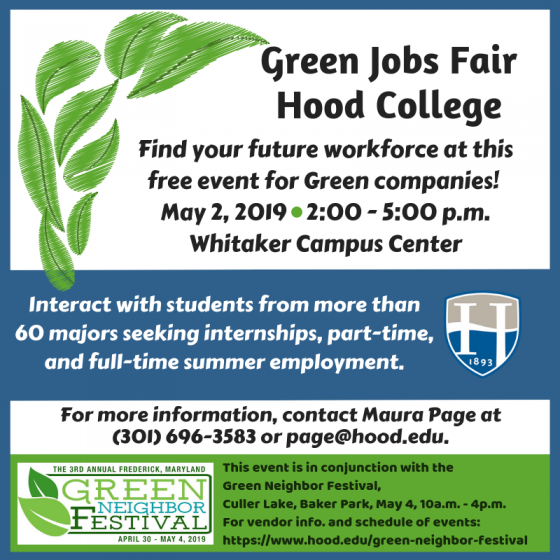 This year (2019) activities are also being planned on the Hood College campus for the entire week leading up to the Festival. Vicki Blazer has been at the USGS National Fish Health Laboratory in Kearneysville, WV since 1992. She received her Ph.D. from the University of Rhode Island and completed a postdoctoral position at the College of Veterinary Medicine, University of Georgia before becoming the Assistant Unit Leader of the Georgia Cooperative Fish and Wildlife Research Unit in the School of Forest Resources, University of Georgia. Vicki is a fish pathologist and has worked on a variety of fish health issues within the Chesapeake Bay watershed and elsewhere throughout the country. Tim Goodfellow is a Principal Planner with the Frederick County Division of Planning and Permitting. A practitioner for over 20 years, Tim has worked in all aspects of public sector land-use planning, including comprehensive land use plan updates, subdivision and development review, water and sewer planning, and comprehensive rezoning processes. Tim has a B.A. from the University of Maryland at College Park and a M.S. 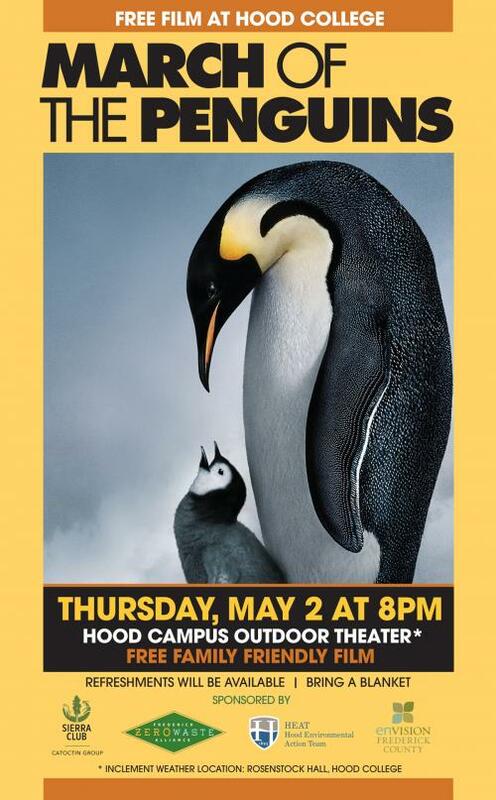 from Hood College. Josh Henesy has been serving the Department of Natural Resources Freshwater Fisheries Program since 2007. During this time, he has worked primarily on the aquatic resources in Washington and Frederick Counties, including the non-tidal Potomac and Monocacy Rivers. He is an avid angler who holds a strong passion and background in riverine ecology and fisheries management. Michael Kashiwagi has been serving the Department of Natural Resources Monitoring and Biological Stream Survey since 2007. He currently works as the Western II Regional manager for the Freshwater Fisheries Program. In his current role he oversees and facilitates the management and protection of freshwater fisheries in Washington and Frederick counties, including the non-tidal Potomac and Monocacy Rivers. Shannon Moore manages the Office of Sustainability and Environmental Resources within the Office of the County Executive at Frederick Government. Her group implements studies and projects to reduce stormwater pollution and flooding, meet regulatory requirements, and engage the public in creating solutions to environmental and sustainability challenges. She holds a Master’s Degree in Environmental Science and Management from the Bren School at the University of California, Santa Barbara. Kevin Sellner, Ph.D., is a Senior Scholar in Hood’s Center for Coastal and Watershed Studies focusing on algal and cyanobacterial blooms, their toxins, and techniques to mitigate these threats to citizens and wildlife. He’s spent 4 decades studying links between water quality and plankton ecology with past lead roles in the interagency research program ECOHAB (Ecology and Oceanography of Harmful Algal Blooms) and directing the Chesapeake Research Consortium to provide scientific input into management decisions and policies within the Federal and State Chesapeake Bay Program. Andy Wilson is an Associate Professor of Environmental Studies at Gettysburg College. He has worked as an ornithologist in the government, non-government and academic sectors for 25 years, in the process published 30 peer-reviewed papers, and several books and book chapters. Andy is a keen birdwatcher and contributes data to several citizen science projects within the Monocacy River watershed. Concerned about Climate Change? 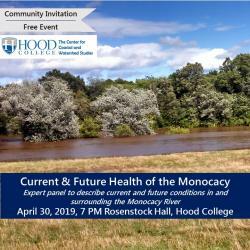 Join us for a panel discussion with County and Town officials to learn about what policies and practices they're implementing to promote sustainability, especially those designed to have a mitigating effect on the challenges induced by climate change. Bring your questions to the forum! Join us prior to the Green Policy Forum for a special date of Frederick Green Drinks to mingle with other green professionals and enthusiasts. 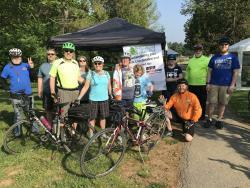 The Sustainability Bike Tour will be led by Jenny Willoughby from The City of Frederick and Roger Rinker of The Bicycle Escape. Tour starts promptly at 9 a.m. and will return to the festival ~10 a.m. This leisurely five-mile ride will show green practices in action around the City, with stops to see sustainability practices in action and learn how you can be a green neighbor too! Riders must not have training wheels and able to control their own bikes. Riders under the age of 16, MUST be with a parent who will be 100% responsible for their safety. Maximum number of riders is 30. As a courtesy, select vendors will be collecting items at their respective booths for reuse and/or recycling. Start saving these items to drop off at the Festival on May 4th. Frederick City Sustainability Manager, Jenny Willoughby, poses with a compost bin available to city residents. Vendors, such as Linda Norris-Waldt for the U.S. Composting Council, educate attendees on eco-friendly practices.